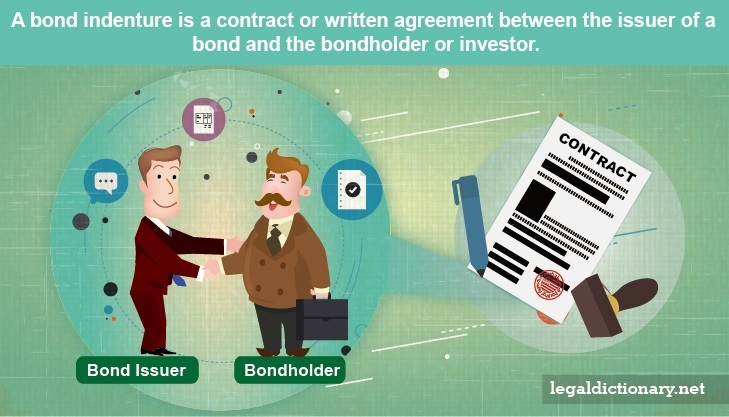 A contract or written agreement between the issuer of a bond and the bondholder or investor is referred to a “bond indenture.” The bond indenture specifies the terms of the contract, including the interest rate, convertibility, maturity date, and other important terms. To explore this concept, consider the following bond indenture definition. noun. An official document in which a corporation, government, or other entity promises to repay an amount of money, plus a stated rate of interest, it has borrowed from an investor on a specified date. It is common for governmental entities, including the federal government, states, counties, and cities, as well as corporations and other institutions sell bonds to consumers to raise funds for a particular project. Bonds of indenture amount to loans made by consumers to such entities. The bond of indenture itself is the document specifying the amount of money borrowed, the rate of interest on the loan, and the date on which the loan with interest will be repaid. When a consumer, referred to as an “investor,” buys a bond, he becomes a creditor to the issuer. Unlike stocks and equities, however, the bondholder does not gain any type of ownership of the entity, though he does hold a greater claim to the entity’s income for repayment than a shareholder. On occasion, bonds of indenture may be offered with no interest, though they still require repayment on a specified date. The appeal of such a bond is in the potential for capital gains. Bonds, also referred to as “coupons,” may be categorized into four basic bond categories based on the tax status of the bond, type and credit quality of the issuer, maturation term, and whether the bond is secured or unsecured. For generations, consumers have invested in U.S. Treasury bonds, as they are considered the safest bonds with almost no possibility of the country’s treasury defaulting on payment. Coupon interest – a periodic payment of interest received by a bondholder between the time the bond is purchased and the time it matures. Capital gain – an increase in value of an investment or bond, resulting in a greater worth at maturity than at the time of purchase. Capital gains on bonds are not realized until the bonds reach maturity. Interest on interest – interest earned on the reinvestment of periodic interest payments. In the context of bonds, all coupon payments may be reinvested at a stated interest rate, being held by the issuer, compounding until the bond matures. This offers a greater payout when the bond matures. Sally buys a $10,000 corporate bond with a 5% return that matures in 10 years. Sally will receive $500 interest payments each year until the bond matures, at which time her $10,000 bond investment will be returned. If the bond Sally has purchased features interest-on-interest payments, sometimes referred to as “compound interest,” Sally’s annual interest payments will be held and reinvested by the issuer, the bond’s interest multiplying or “compounding” on the increased amounts each year. Sally’s payout when the bond matures will be considerably higher than if she had simply accepted annual coupon interest payments. Corporations raising capital through the issuance of bonds rely on an underwriter to draft the terms of the bonds. Such terms include the bond amounts, interest rate, maturity date, and any constraints on the corporation’s actions. Because such corporate bonds amount to a financial contract between the issuer and each bondholder, the corporation is usually especially careful about the limitations placed on it by the bond indenture. Consumers considering the purchase of corporate bonds should carefully examine not only the amount and interest rate of the bonds, but any other specifications, such as corporate constraints. Bond issuers often purchase bond insurance that guarantees payment to bondholders of both principal and interest on their holdings in the event the issuer defaults. Bond insurance, also called “financial guarantee insurance,” charges a premium to the bond issuer. The amount of the premium reflects the perceived financial risk or failure of the bond issuer.